Here is our Used Auto-Sleeper Mercedes Wiltshire Duo Automatic 2013/13. This is a luxury 2/4 berth, low-profile, coach-built motor home, first registered in March 2013. Our Wiltshire is a 1 owner, coach-built motorhome and has covered just 26,000 miles. 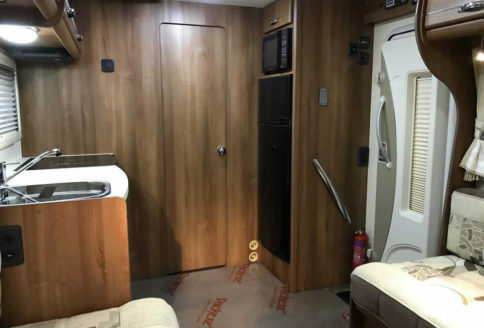 Built on a Mercedes chassis, the luxurious Wiltshire layout features an end bathroom with separate shower, a fully enclosed rear bedroom with comfortable twin beds and a large front lounge featuring a kitchen and twin, opposing sofas. 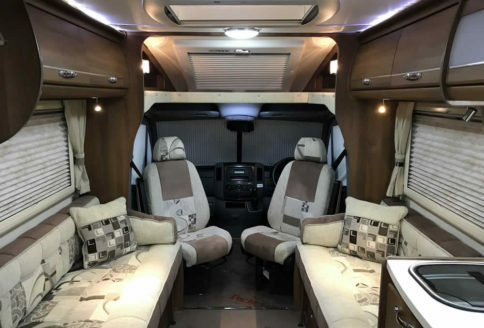 Our Wiltshire has an impressive standard specification which includes cab air conditioning, cruise control and electric windows, as well as alloy wheels. 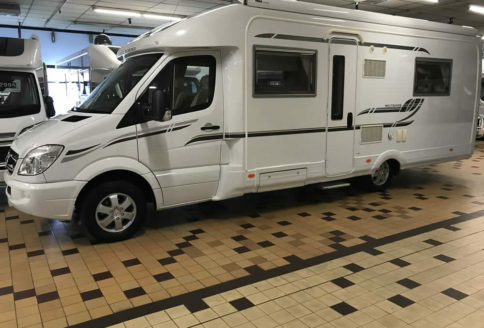 Mercedes use their powerful 2.2, 163 bhp turbo diesel and fully automatic transmission mated to rear wheel drive for optimum control and comfort – perfect for a luxury motorhome. 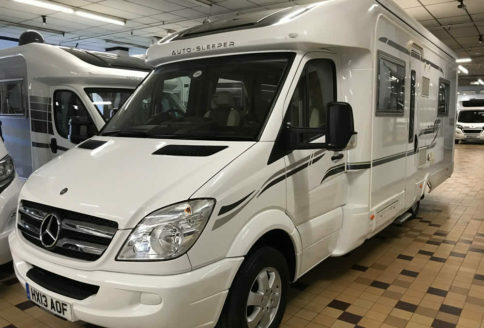 Our Used Auto-Sleeper Mercedes Wiltshire Duo Automatic 2013/13 Plate, as with all Auto-Sleepers, is a very impressive motorhome. For cooks, the kitchen features a full-size cooker with dual fuel hob and separate oven and grill while an electric hood deals with cooking smells. There’s even a microwave oven and a large three-way fridge with a separate freezer above too. For drivers, the Wiltshire’s cab specification includes electric door mirrors, a hard-wired colour reversing camera and an adjustable steering column. Removable carpets, including the cab, are standard throughout and there’s also central locking and a cab alarm and engine immobiliser. Both cab seats swivel for relaxing when the driving stops. The Wiltshire Duo has ample storage, to be found in several overhead lockers, under sofas, in cupboards and under the beds too. So, you’re never going to be short of storage space. The Lounge is a very comfortable space for relaxing and as mentioned, the cab seats swivel, there’s a large sky-view over-cab window, large side windows and large “Heki” style rooflight too. 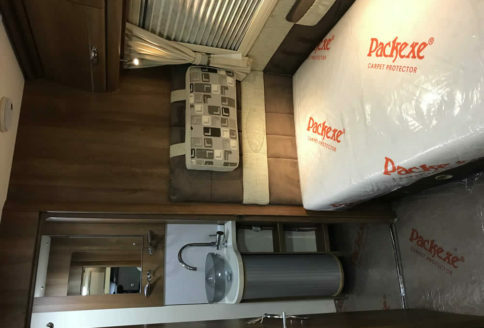 The end shower room comprises of a cassette toilet, a stylish sink and a separate shower so, as this is fully enclosed, the rest of the room remains dry when used. Warm air from the “Truma” heating system is ducted in to the shower room, the bedroom and living space too. Finally, the bedroom – a good sized room featuring two domestic sized single beds with memory-foam mattresses and fully closed off from the lounge. There are two wardrobes, one above the end of each bed, several overhead lockers and reading lamps at the head of each bed too. Finally, there are large windows to each side with blinds and fly-screens and an opening rooflight, again with blind and fly-screen. Well, fortunately there are no Devils with a Wiltshire Duo, but it does have a full-length awning, a free-standing table for use inside or out and rear, wind-down steadies for stability when parked. Also found outside, is an external gas bbq point, an external 230v plug socket (very handy) and an external shower point (also really useful). 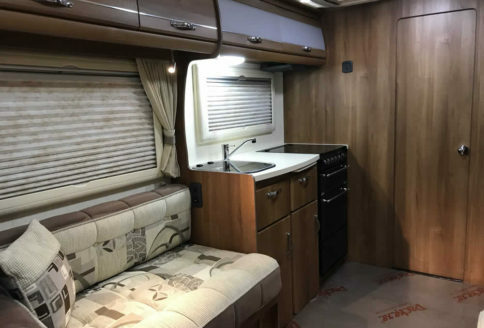 On the roof is a solar panel and digital TV aerial, while there’s an electric step to ease getting in and out of the motorhome and a Mercedes alarm system for the cab and central locking all around. The lounge’s twin sofas are very comfortable and will also convert into a double bed too when required, so, room for guests maybe? The lounge has large opening windows, all with blinds and fly-screens too but there are also decorative curtains for the finishing touch. Treat yourself to some real luxury this year. Part exchanges a pleasure.